You can turn any UPLIFT Desk into a fully-customizable, height-adjustable treadmill desk by simply adding a Lifespan treadmill. Shop our full selection of UPLIFT Treadmill Desks to find a great replacement. Get out of your chair and onto an accessory that keeps you moving at work; the LifeSpan TR1200-DT5 Treadmill Desk is the intelligent, sleek, ergonomic office addition you've been waiting for. Walk your way to better health and work at your adjustable height desk and feel what optimal ergonomics can do for your energy levels and productivity from the get-go. 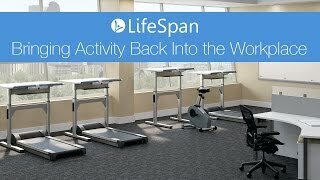 The LifeSpan Treadmill Desk includes padded arms rests, a cable management tray, and a display panel which tracks your walking stats, letting you know how far you've walked and how many calories you burn. Work better with one major desk game changer. Height adjustment 41" - 55"
Choose from one of the following three LifeSpan Treadmill models for your LifeSpan DT5 Treadmill Desk: TR800-DT3, TR1200-DT3, or TR5000-DT3. The LifeSpan DT5 Treadmill Desk comes in your choice of four desktop colors: Cool gray, Absolute Acajou, Hardrock Maple, or Wild Cherry. The UPLIFT Treadmill Mat is a must-have accessory for your walking workstation. The mat will help prevent dust and dirt from getting into the machinery of your treadmill, keeping your equipment safe. It helps to absorb impact, reduce vibrations, and protect your floor, and the textured, non-slip surface is easy to clean. The UPLIFT Treadmill Mat puts the finishing touch on your treadmill desk set-up. This product comes standard with a lifetime warranty on the frame, along with a 3-year warranty on the motor, a 2-year warranty on parts, and a 1-year warranty on labor. $1,799.00 List Price: $1,999.00* The list price is the same as the MSRP (Manufacturer's Suggested Retail Price). It may not necessarily be the price at which the product is sold.